I’m a HUGE chocolate fan, mostly dark chocolate but I do have a special place in my heart for white chocolate. As a little girl, my sister and I would love going to the local candy store to buy a giant chunk of white chocolate. We would obsess over eating it really slow to make it last longer… did I mention I’ve always been obsessed with sweets?! 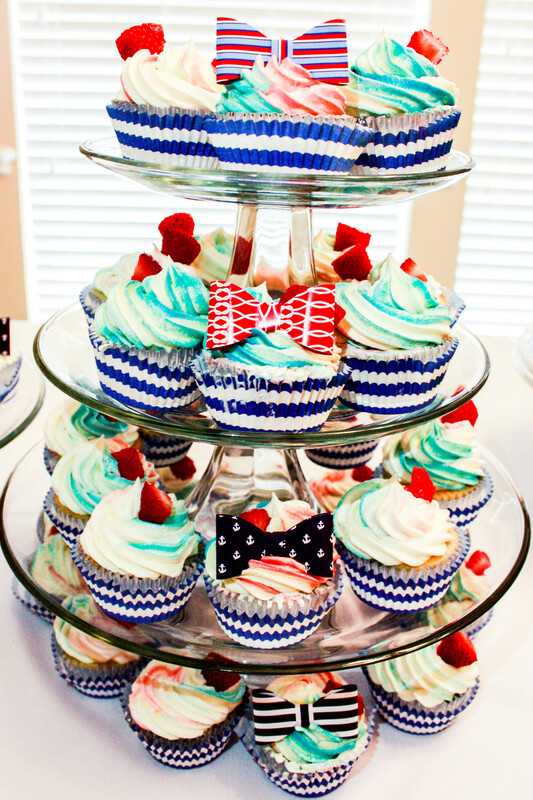 This cupcake is excellent for a party, it’s light, delicious and a showstopper. Everyone stops to ask, “What’s in this frosting?” I made it the first time for my husband’s birthday, I adapted a few things and made this iteration for a nautical themed baby shower for a dear friend. They were a big hit both times, but I think this recipe is a perfect combination. Next time, to add in a wow factor, I will make a strawberry compote instead of using jam, however jam is a big time saver! So, what is it about this frosting that drives people crazy?! They can’t quite put their finger on it and when I tell them it only has two ingredients, they are truly baffled. But really, it is just butter and white chocolate! I do have to admit, I was amazed this recipe worked the first time I made it, but it does and it pipes beautifully! I hope you enjoy it as much as I have. Preheat oven to 350 and line cupcake pan. Over a double boiler melt 4oz white chocolate bar and set aside. To be honest, melt is really not the perfect description it melts into a sort of clump. The most important rule, that I learned the hard way, is heat white chocolate on LOW – it burns at a very low temperature. In a large bowl sift together 1 1/2c flour, 1/2t salt, and 1t baking powder. 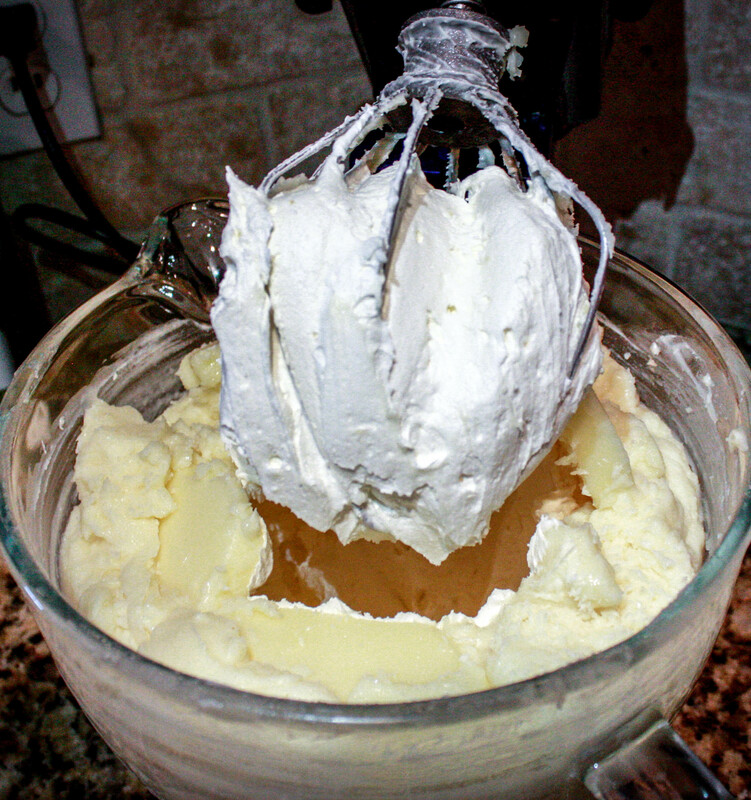 In a stand mixer combine 1/2c butter and 1c sugar for 2 minutes. Mix in 2 eggs one at a time. Add 3/4c milk, 1t vanilla, and melted chocolate until well combined. Slowly incorporate dry ingredients and mix for 2-3 minutes. Fill cupcakes 2/3 full and bake for 18-20 minutes. Set on cooling racks and allow to cool for about 15 minutes. Core the center of the cupcake (I use a frosting tip to do this) and add your strawberry jam. I also dropped in an extra white chocolate chip into each. If preparing these cupcakes for a later date, I recommend you freeze the cupcakes in the cupcake pan by wrapping them in saran wrap and then aluminum foil. Pull out of freezer to frost 24 hours prior to your event. In a large saucepan combine 2c butter and 2c white chocolate chips. Melt together over LOW heat, stirring. The butter and white chocolate will separate. It is very important to keep the heat on low. When the butter and white chocolate is completely melted, remove from heat and allow to sit at room temperature for 15 minutes. Cover the saucepan and refrigerate until the mixture becomes solid (approximately 3 hours) but I always let my sit overnight. Place entire mass into bowl of stand mixer with whisk attachment and beat on High for 2-3 minutes until frosting becomes light and fluffy. These cupcakes are a white chocolate experience, in the best sort of way! I like to top off the cupcake with a quarter strawberry to really complete flavor combination. Enjoy! Thanks, dezaro! Well, food tastes better when it’s pretty.. Or at least I think so! they look delicious ! I must try this recipe ! Hey, thanks for liking my post! Your baked goods look so impressive, I’ve never thought of using white chocolate chips and butter to make icing. My bf is a huge white chocolate fan, so I’m definitely saving this recipe!